Jerry Jones' colossal ego monument, Cowboys Stadium, is a grandiose facility. When it first opened, every announcer for every televised game there spent the entire telecast raving about it. The stadium's already hosted a Super Bowl. The Cotton Bowl was moved out of the actual Cotton Bowl...so it could be held at Cowboys Stadium. In three years, it'll host the Final Four. 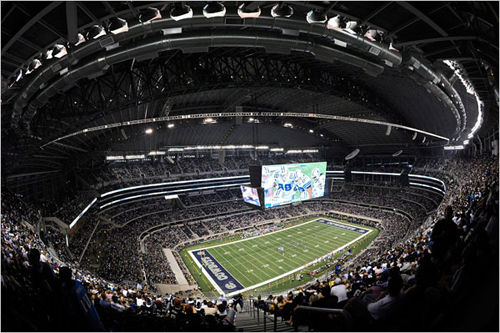 Oh, and the Cowboys play there. The point is, just as Jones wanted his palace to be larger than life, so are the events it typically hosts. And that's why it surprised us to learn that the Arlington Colossus is currently hosting...a bowling tournament. Granted, it's not just any bowling tournament - it's the U.S. Women's Open. But this is a game that holds major tournaments at venues in humble shopping centers where my friends and I would have birthday parties when we were little kids. Of course they show the action on the Giant Screen of Doom. It's probably a better view, even with seats practically right on top of the action. And honestly, as taken aback as we were initially by the idea of bowling in this place, it appears to be a pretty nice crowd (apparently, 6,000 showed up), if not exactly a filled-to-capacity affair. Either way...bowling! Cowboys Stadium! That building's wonders may be boundless. In light of having a bowling tournament at a football stadium, though, it does only seem fair to us that the Cowboys now play a football game at Brunswick Zone Carolier.